Bangkok (VNA) – A delegation of the Vietnamese Consulate General in Khon Kaen, Thailand, on August 2 visited Vietnamese families in Thailand’s northeastern province of Sakon Nakhon province affected by the recent floods. Sharing flood-triggered losses of the overseas Vietnamese, Consul General Nguyen Ngoc Son noted his hope that they will promptly overcome consequences of the floods and stabilise their lives. On this occasion, Son handed over a fund in support the flood victims to the Vietnamese Association in Sakon Nakhon. The same day, the Vietnamese Association in Nongbua Lamphu province and the 2002 Women Association in Khon Kaen province presented 179,000 baht (roughly 5,400 USD) to Vietnamese flood victims in Sakon Nakhon. Over the past days, Vietnamese across Thailand raised about 500,000 baht (15,000 USD) to support flood victims in the locality. It is estimated that about 400 Vietnamese families in Sakon Nakhon affected by the floods, the worst in the past nearly 40 years causing losses estimated at more than 4 million USD. 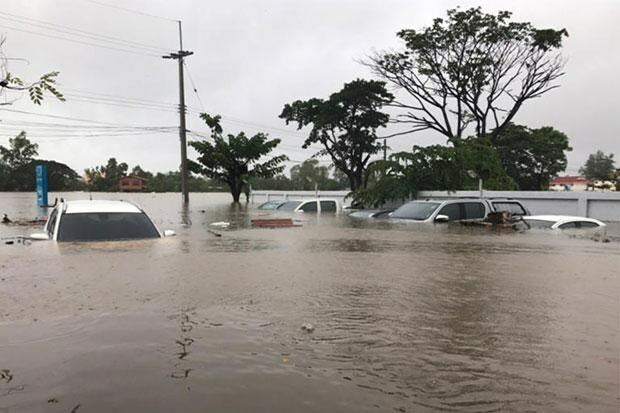 According to the Thai natural disaster prevention and mitigation agency, heavy and torrential rains from July 5-August 2 flooded more than 7,700 villages in 44 provinces. The flood has receded in 34 provinces, however ten others, mainly in the northeastern region, are still battling severe floods. At least 14 people were killed and almost 252,000 families in 4,609 villages were affected.